Green Chili, finely chopped, amount would depend on how spicy you want it. Make the filling and keep aside. To do so, Heat Olive oil in pan. When the oil is hot and add Mustard seeds and wait for it to splutter. Add some of the chopped chili, add onion n sauté for 1min. Add cabbage and sauté for 1 min on high flame. Add carrots and sauté for 1min. Add chili powder, cumin powder, pepper powder, salt to taste (should be on the lesser side) and sauté for another min or 2 while stirring. Add the rest of the chili, mix and remove from pan. Now it’s time to make the omelet. For that, break 2 eggs in a bowl and beat it with the fork or an egg-beater till it becomes frothy. Add salt (should be less than usual) and mix well again. Heat olive oil in a pan. Put the mixture into the pan and spread it uniformly. Fry one side until light brown and flip. Place half of the sautéed veggie mixture and 2 tbsp. cheese and fold the omelet. Remove from pan once the omelet is golden brown. Repeat steps 4 to 8 for the 2nd omelet. 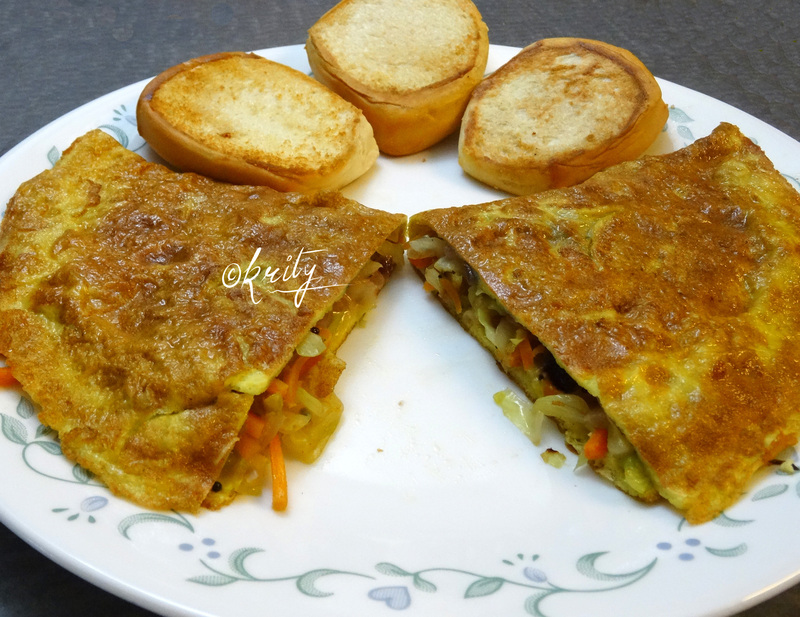 You can serve the Stuffed veggie cheese omelet with bread or buns.